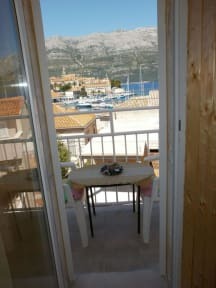 The apartments 'Neno' have a very good location and a wonderful view.It is located in the most attractive part of the town of Korcula,between the centre of the town the centre of the town beach.It is about 100 meters away from the centre of the town,shops,bus station,passenger ship terminal,town beach.The houses are surrounded by Mediterranean gardens,flowers and greens. Close the apartments there are lots of restaurants and cafes and ACI marina as well. 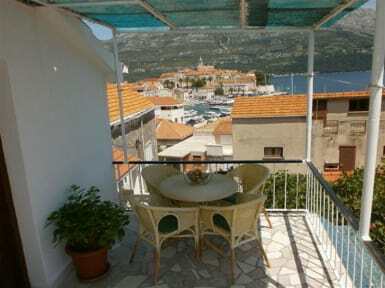 1.Two bedrooms apartment with a sea view consist of four beds in two bedrooms,kitchen with kitchenette,kettle and fridge,large terrace with a wonderful sea view and a view toward the old town of Korcula.Each room has private bathroom and air conditioning. 2.Apartment for 2 persons consists of double bedroom,kitchen with all appliances and dishes,toilet(shower,air conditioned,own terrace,separate entrance.This apartment is surrounded by flowers.